On June 8, 2018, theaters will be showing the documentary film Won’t You Be My Neighbor?, which focuses on children’s television icon Fred Rogers. What is so significant about the film is viewers get a chance to hear about the life of children’s programming creator Fred Rogers and his idea to bring love and kindness to television. Rogers used the television format to help children learn that love and respect for each other is the key to their well-being. 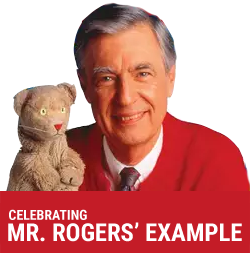 While he would open the show with It’s a Beautiful Day in the Neighborhood (Won’t You Be My Neighbor), Mr. Rogers would end his show with the song Good Feeling, telling viewers that by being themselves they are making the day special. Mr. Rogers was always respectful of children and didn’t treat them as less-than adults or inferior, but as human beings who had valid feelings and deserved love above all else. As a child, I fondly remember thumbing through the television stations and finding PBS showing Mister Rogers’ Neighborhood. I would stop on the station to see what adventures Mr. Rogers was taking in the episode. While some children enjoyed the Neighborhood of Make-Believe (the home of the puppets), I enjoyed Mr. Rogers’ field trips most. I remember him visiting a zipper factory. He walked around to different employees and was fascinated by how important each employee’s work was to make a zipper. Maybe it was these little field trips that peaked my interest in reading nonfiction. If I couldn’t go on field trips to find the answers, I could read about it in books. Mr. Rogers format may have been different from the one we discuss- books. However, children’s literature needs to be viewed through the same Fred Rogers lens. He used television to teach and nurture children just as children’s literature strives to do the same. Children’s literature is much more than just a cute story. Yes, there are plenty of cute stories in children’s literature, but even a cute story can teach so much to a child. It can teach love, compassion, kindness, sharing, respect, equality, and so much more. Every two weeks Read and Shine spotlights children’s literature. With author interviews, reading lists, book awards, and lesson ideas, we are working together with you to teach and nurture children. Literature can be powerful in the life of a child. It can assure him that there are others like him. It can validate his feelings and thoughts. It can help him understand uncertainties. As we bring literature into classrooms and homes, we are feeding a soul not just sharing a story.